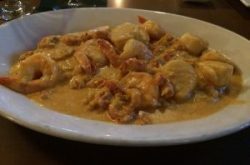 Any discussion of Leo’s Ristorante that doesn’t acknowledge its place in history as one of the original Shrewsbury Street dining landmarks is like taking visitors on a tour of Worcester and bypassing Turtle Boy or taking them to the base of George Street without challenging them to a race to the summit. So let me note here that, decades ago, there were very few dining options in town. Leo’s was one of those few, and even at that distant point in history, it occupied its corner of “the street,” seemingly, forever. The serving staff had worked there for so long, servers would write up your order before they got to your table. Clusters of plastic grapes on the walls had collected greasy dust forever. In short, it was the classic Italian restaurant. Fast forward to the present, and you’ll still find a Leo’s Ristorante eternally populated by regular customers. So much so that the warren of dining rooms, connecting hallways and lounges are posted with signs indicating, “Seat Yourself.” Customers seem to have their own seats, but those new to the place – who manage to find their way to Bracket Court and pass through Leo’s front door – might wander off to a table in one of the “mercy meal” rooms. Who would notice? True enough, Leo’s is part of the bedrock of Worcester dining. But that doesn’t mean its cuisine stagnated 50 years ago. The menu continues to evolve, making Leo’s a solid candidate when making one’s choice of dining venue. This was shown true once again on a recent visit. Soon after my friend and I had “seated ourselves” within easy view of a plaster replica of Aphrodite, we were greeted and presented with menus. Marci, our server, offered to take our drink order but good-naturedly understood when I begged a few minutes to develop my meal strategy. 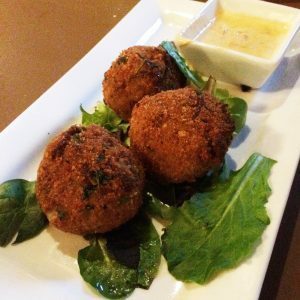 From the list of daily specials, we started with Leo’s Arancini. 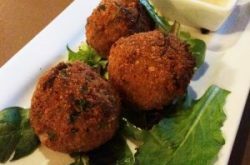 This was an order of three balls that were fried crunchy and deep brown on the outside; inside, the softened rice was formed around a core of mozzarella cheese. My friend observed, “Bits of mushrooms add a depth of flavor to what is often just deep-fried rice with mozzarella.” A dipping sauce tinged pink with bits of tomato provided an additional flavor element. That analytical moment gave way to humor when we noticed each other tackling the comically stretchy center of molten mozzarella. Soon enough, fork loads of long cheesy strands stretched from plates, across the table, and to our chins. There was no room for the self-conscious at this table. Our entrees arrived just as an adjacent table was bursting forth in a chorus of “Happy Birthday” and digging into their dessert of tiramisu. Within moments, the focus of my world was narrowed from that revelry to the dish in front of me. That’s because of my bowl of Seafood Risotto alla Milanese. From my first sampling, its richness and sumptuous seafood flavor exceeded any reasonable expectations. 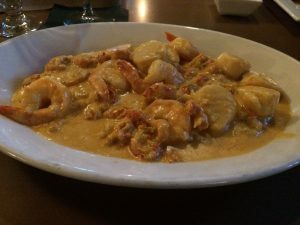 Delicate chunks of flavorful lobster meat had dissolved into the creamy Arborio rice to create a velvety sauce that enveloped generous handfuls of juicy shrimp and jumbo sea scallops. Each shellfish specimen had lent its fragile flavor to the dish, and every now and then, an intact bit of lobster appeared amongst the still-firm rice. It was an elegant dining experience enhanced by a glass of Josh Sauvignon Blanc, whose crisp freshness provided an ideal counterpoint. Simultaneously, my friend seemed equally pleased with his entrée, Veal Saltimbocca. Insisting that it was richer than my risotto, I scoffed in disbelief. True, the quartet of tender veal cutlets had been layered with thin slices of prosciutto and smothered in sautéed mushrooms, all drenched in a deep-brown wine sauce. But really! Richer than creamy, lobster-infused Arborio rice? Not a chance! The absence of fresh sage indicated the chef had taken some liberty with the standard recipe, but he’s not alone – it’s been years since I’ve encountered the classic version. Sometimes, it’s hard to believe that, amidst the burgeoning dining scene in Worcester, there remain a few of her original “pioneers” who still keep pace. That’s just what Leo’s Ristorante continues to do. And it does it with the weight of its ancestors looking down; their portraits and testimonials grace the walls.